After piercing your ears for the first time, starter studs are put in place. Afterward, skin will develop around the hole, healing around the earrings, allowing them to be interchanged regularly. 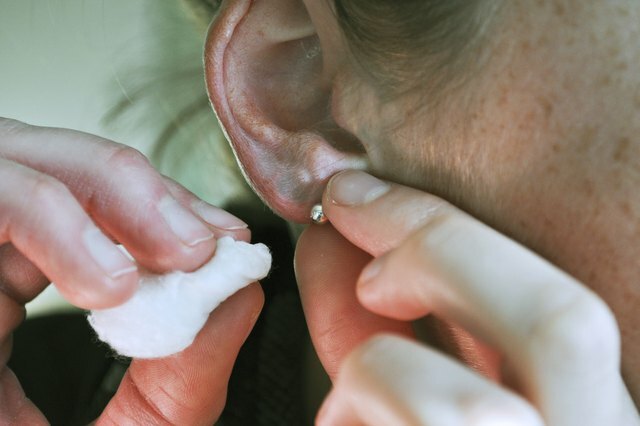 Before changing them out though, make sure to leave in the studs for six weeks, during which you should clean the ear lobes and studs at least once a day, every day. The removal can sometimes be difficult, but there are ways to make the process easier. Clean your ear piercings. Use a cotton ball dipped in hydrogen peroxide to rub your ear lobes while the studs are still in. Loosen the stud's bond with the hole by twisting it in a clockwise direction several times until it turns with ease. If this is painful, you may have already developed an infection or you didn't leave in your stud long enough. Wait a week -- turning the stud daily -- until the pain stops. Then proceed to Step 3. If the pain continues, consult a medical professional. 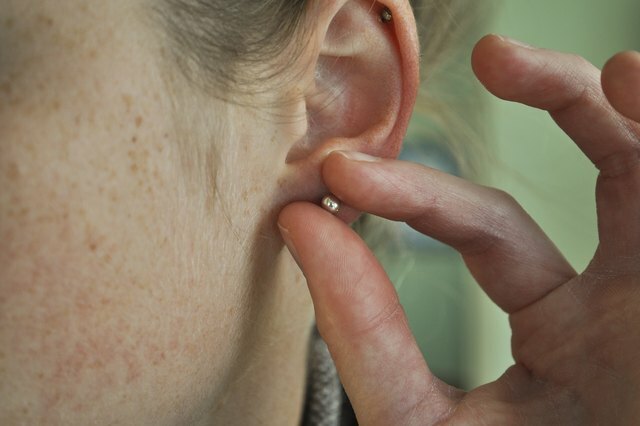 Hold the front of the stud steady with one hand, cupping the bottom of your ear lobe with your finger. Do not pull down on your ear lobe. Use your other hand to pinch the stud backing between your index finger and thumb. 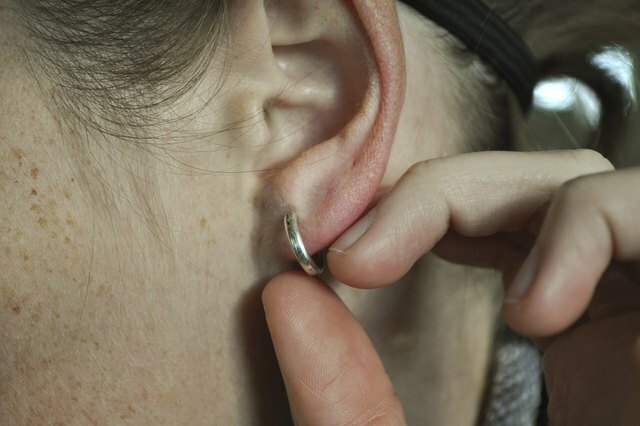 Pull the back out of the earring gently and quickly, keeping the stud in place. 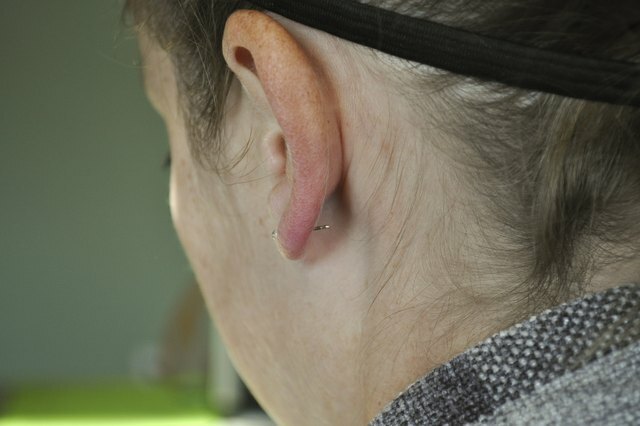 Do not attempt to pull the two pieces away from each other simultaneously -- this will be more painful and can cause stretching in your ear lobe. Insert a hypoallergenic earring, preferably a stud or small hoop, into the piercing. 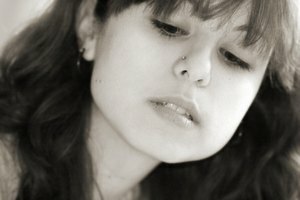 If you don't wear earrings for a while immediately after a piercing, the hole will heal and close up, resulting in the need for a new piercing. Repeat steps 2 through 5 for the piercing in your other ear.